Marta de Andrés, better known as Marta Nael, showed skills for drawing and painting since very early age. Soon she realised that she wanted to devote herself to that when she grew up and since then, she has not stopped drawing. She feels true devotion for all artistic disciplines, but after completing her studies in Fine Arts, she discovered her passion: matte painting and concept art. 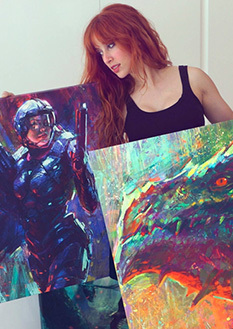 In the last years, she has developed her own style that can be described as “a game of light and colour”, and in her side of digital painting the “Digital impressionism”, which has made her join many projects, like the design of record or book covers. She was awarded with the Expomanga prize to the best Spanish illustrator in 2011, and also in that year the prize Rising Stars of the British magazine ImagineFX. She has published four artbooks: Impressions: The Digital Art of Marta Nael, Lux, a clash of light and color, Sketchbook 01 and Sketchbook 02. She has also collaborated with Ediciones Babylon creating many illustrations.